Glamour, exuberance, luxury, contradiction: these pillars of Art Deco style are found from floor to ceiling in every room of this interior. 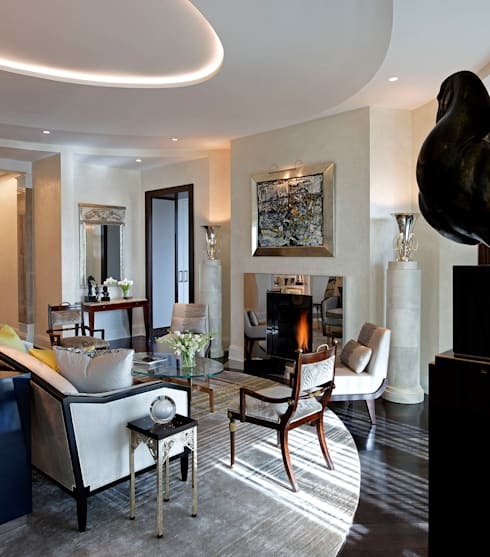 In this project, the interior designers from Douglas Design haven’t just created a comfortable and stylish living space – they’ve cultivated the emergence of a major 20th century style movement known as Art Deco (also referred to as Art Moderne). This style became popular in the 1920s, influencing the design of just about anything – from automobiles to architecture to household appliances. Cubism plays a major part in Art Deco, as does a desire to celebrate technological progress and modernity – for this reason, you’ll find bold geometric themes coupled with a sort of futuristic flair, with shiny metals and polished glass representing modernity and progress. In this home, you’ll also see how Art Deco often favors the juxtaposition of many styles, taking on a contradictory attitude characteristic of Art Deco style. 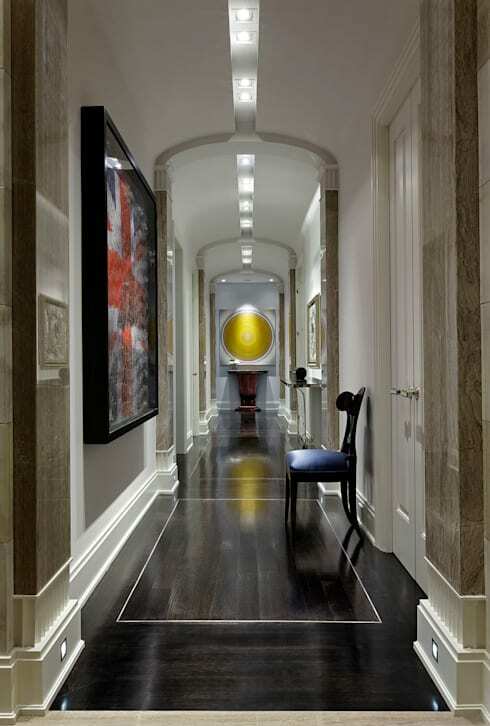 You’d be more likely to find this arched hallway in a boutique hotel than in a home – everything from the elaborate trim and stone columns to the antique furniture and art placed throughout the space sets the tone for a journey back to the early part of the 20th century. 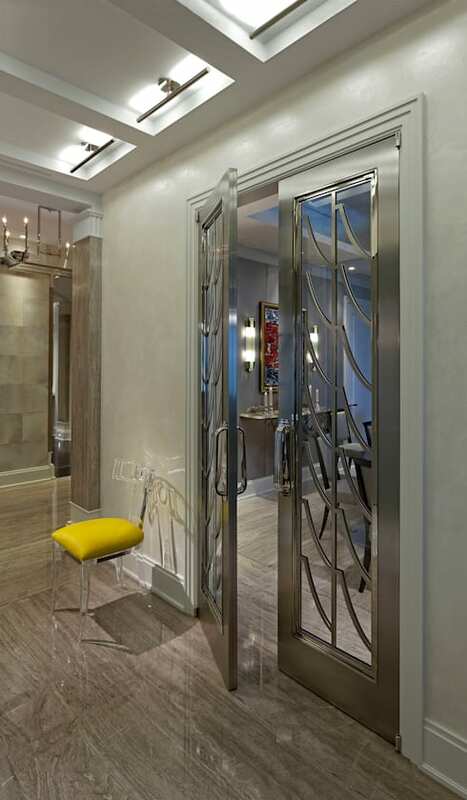 Glamour and exuberance shine through these silver doors, the geometric design of their decorative silver frames aligning well with the Art Deco philosophy of turning every single aspect of a space – even a functional aspect such as a door – into an embellished, decorative object. The Art Deco movement shifted over a span of about 20 years – from a 1920’s obsession with the exotic and expensive to a 1930’s focus on the curved, polished forms of Art Deco “Streamline Moderne”, the movement saw a great variety of attitudes and styles. 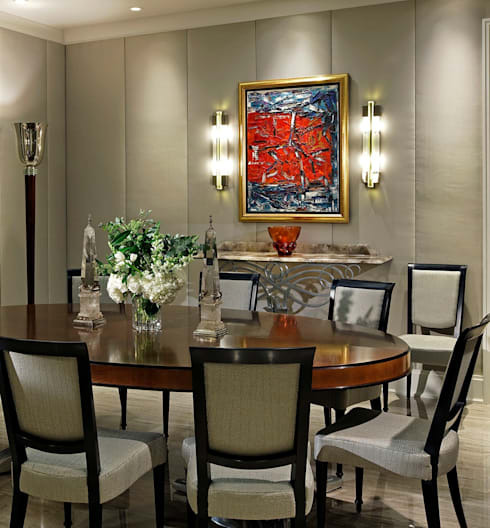 This dining room draws inspiration from just about every defining moment of Art Deco: showy glass statues speak of glamour, while muted grey walls hail from mid Great Depression Art Deco style. 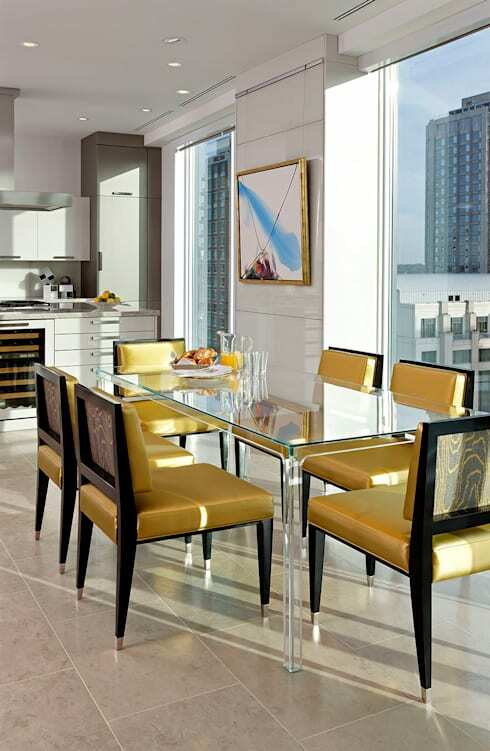 Shiny golds and silvers display a taste for rich materials. 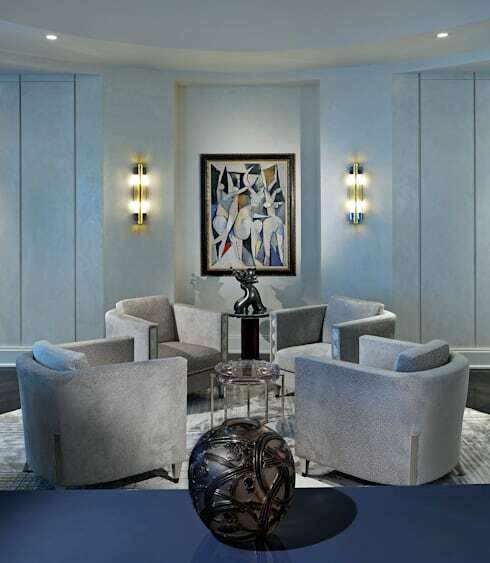 Overall, this space is an excellent example of the contradictory attitude of Art Deco style, with precious objects and elaborate details contradicting the otherwise streamlined and subdued attitude of the chairs, table, walls, and ceiling of the room. Filled with an assortment of antique and contemporary furniture, this Art Deco living room fills your vision with interesting lines, shapes, and materials, setting a vibrant stage where you’re never quite sure what to expect next. Look for characteristic items such as framed mirrors, metallic objects, and artistic sculptures – and don’t overlook the lovely false ceiling whose curved lines give a clear reflection of the oval theme found in the floor and central table. Could there be a better example of an Art Deco revival than in this blue-hued sitting room? 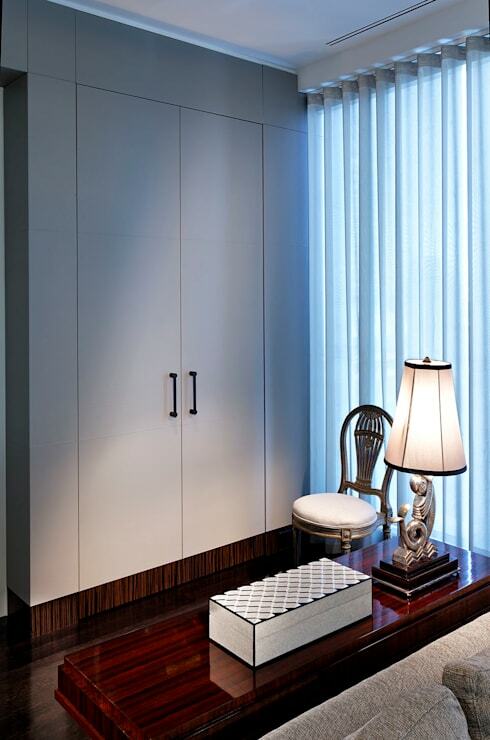 This space celebrates the influence of Cubism with a framed cubist painting sitting as the focal point of the room. An audience of arm chairs in a symmetrical arrangement in a reflection of the manifested symmetry and simplicity inherent in an interior inspired by Cubism, while decorative sculptures offer a range of exotic art styles. 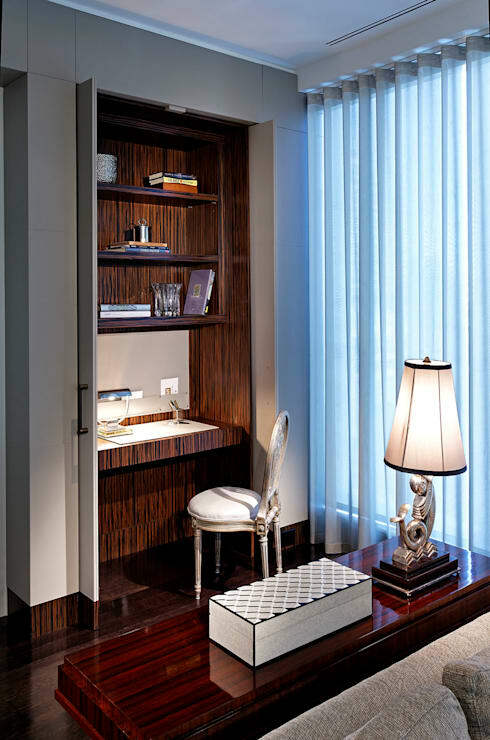 A dose of modernity comes into play here; this little office is designed to fold away neatly behind double doors, simplifying the visual scene so you can fully enjoy the interesting artistic artifacts that identify the room as an Art Deco revival. Elegant antiques and decorative motifs define this luxurious and history-inspired space – the painted dresser is an absolute Art Deco dream, no doubt a treasure that has been preserved by someone with an appreciation for the embellished, glamorous aesthetic of its intricate handiwork. 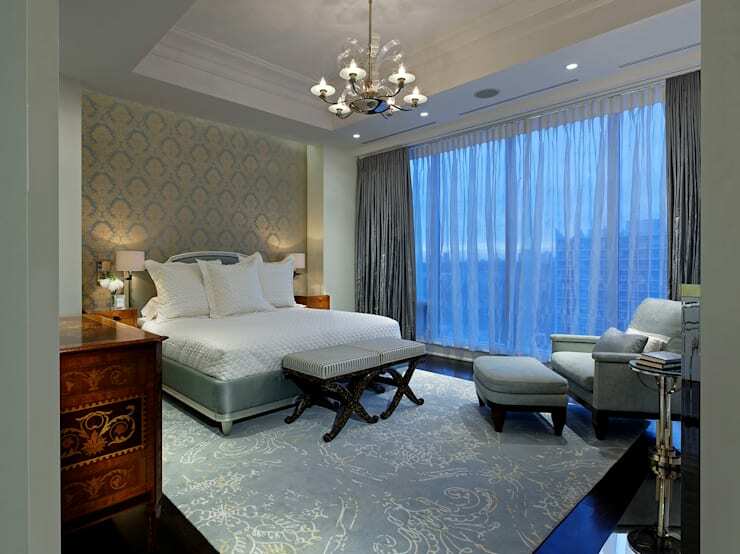 A flair for the exotic pops up in this bedroom; an Asian folding mural celebrates the strong tendency towards Oriental Art that was incorporated into many aspects of 1920’s Art Deco style. 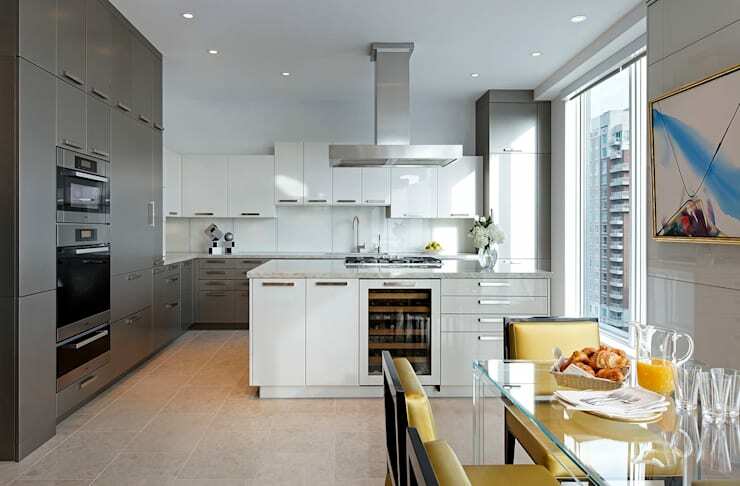 Perhaps the only room of the tour that isn’t completely defined by Art Deco style, this kitchen offers a contemporary cooking space with plenty of smooth countertops, modern appliances, and floor-to-ceiling storage. However modern the kitchen might be, you’ll still notice a bit of Art Deco influence creeping into the kitchen table – when plastic became widely accessible as an interior decorating medium, Art Deco welcomed the technological progress by showcasing plastic furniture and decor in many interior designs. What do you think of this Art Deco inspired home decor? Comment below!